The day will inevitably arrive when your children will come to you asking for a car. Few parents can escape this reality of life and it can be a very worrying time. If your child was an adult it would not be so much of a problem, but as the age at which your child is able to get their licence to drive has gotten steadily lower, the problem has become more serious for many parents as any car can be a lethal weapon if mishandled. Cars can be lethal weapons because if mistreated they can kill and they often do. However, we all have to face the fact that one day our children will reach the age where they want to buy their own car. You might have brought your son or daughter up to be responsible and quite trustworthy but all drivers know this doesn't always prevent them from being involved in a serious accident and being killed or killing someone else. No matter what your feelings are on this subject, you will have to make a decision. When that time comes you can be pretty certain that your offspring will win and the car will eventually be purchased. Why is this so? It will happen because it is what all parents have to do eventually. We have to allow our children to grow up. They have to start taking responsibility for their own lives and the lives of others around them. 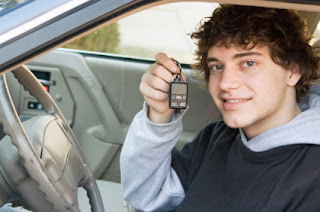 Getting their license and driving their own car does instils a sense of independence and responsibility like no other experience they will have to encounter at that stage in their lives. They will have to obey road rules, they will have to be wary of whether others around them are obeying road rules or not, and they will have to take responsibility for the lives of those they carry in the car with them. Once you finally relinquish some of your fear and you agree that the car can be purchased you have to look for ways this can be achieved. You could go with your son or daughter to the local car yard and choose a suitable vehicle there and then. Go for a test drive. Hand over the money and it’s all over. But this would be irresponsible? What's more, you would be sending the wrong message? You could be setting up your son or daughter for a lot of heartache at a later date. Firstly, owning a car is a big investment and this should be recognised by the child. If it is too easy they will not treat it as something they should cherish and a bingle here and there would not worry them. The child has to have some input into the purchase in some way so that they realise its value. Therefore whether or not you can afford to do so, you shouldn't hand them their first car too easily. Repayments are always cheaper if you pay a deposit on a car to bring down the amount of the loan, therefore if you pay a reasonable deposit for the vehicle and your child has to agree to meet the repayments every month, you would be helping them realise that nothing good comes to them without having to pay for it. You could pay a sufficient amount of deposit that would bring the repayments down to a manageable amount to what they can afford. You could have a look around the car yards to see what type of car they would like and find out how much it will cost. Then have them agree to save for a deposit and you'll meet them half way with the repayments. The act of looking for the car they want will instil an incentive to save. You will be surprised at what they can put away when they put their minds to it. The habit of saving for the deposit could then be extended in making at least half of the regular repayments required to pay it off with you helping pay the remainder. If you are in business and you lease various vehicles you could add one more vehicle to your fleet and insist your child pay the extra lease amount, or part of the amount. In this way you could probably afford a much later model than you would if you took out a separate car loan so you can rest assured your child is driving a car with all of the latest safety features. In order to instil a sense of value you could insist that your budding new car owner sell something they have of value in order to help raise sufficient funds for a deposit. It could be a bit of furniture they have, a bicycle, or their iPad...although that might be going too far. However, as long as they get the message that in order to get what they want they might have to relinquish something else of value, the message will be a valuable one. You could offer an arrangement whereby you pay dollar for dollar on whatever they raise to make their sacrifice more worthwhile.